Three people have been taken into custody for attempting to enter private property near the Dakota Access Pipeline’s horizontal drill pad, according to police. Water protectors said they were on a prayer walk when they were tear gassed by police. About 200 people moved from the main protest camp and headed north on the Missouri River in North Dakota on Monday afternoon and cut a fence about 700 feet away from the DAPL’s drill pad, the Morton County Sheriff’s Office said. A long line of local police and National Guard soldiers holding plastic baton shields prevented protesters from entering the property by pushing them back and firing several rounds of tear gas at them, a video posted on Facebook showed. Police said they arrested three people and have charged them with criminal trespass, inciting a riot and resisting arrest, according to UPI. 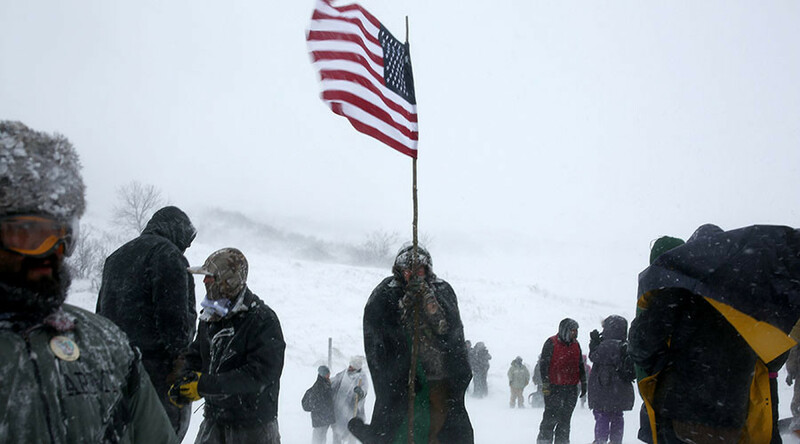 "On Martin Luther King Jr. Day, ND law enforcement shot at and tear gassed people praying and expressing their 1st amendment rights," Dakota/Lakota Sioux writer Ruth Hopkins posted on Twitter. Officials said the protest dispersed around 7:00pm. Jon Ziegler, who identifies as a citizen journalist, posted photos and video on Facebook of the anti-drone Avenger Air Defense System deployed on a hill guarding the Dakota Access drill pad. “These systems have observation capabilities and are used strictly in the observation role to protect private property and public safety,” North Dakota Guard spokesman William Prokopyk told the Daily Beast, assuring that the military equipment’s missile tubes were empty and not authorized to be armed. “These systems have observation capabilities and are used strictly in the observation role to protect private property and public safety,” Prokopyk said, adding two of the systems have been in Morton County over a month without incident, according to the Daily Beast. At least 589 people have been arrested since August over DAPL protests. Last month, the US Army Corps of Engineers denied an easement permit needed for drilling under the Missouri River, and have begun an environmental review, after months of protest at the site. As proposed, the controversial $3.7 billion pipeline would carry hundreds of thousands of barrels of oil from North Dakota’s oil fields to Illinois and then onto the southern US coast. Native American tribes, including the Standing Rock Sioux Tribe, launched protests against the 1,134-mile oil pipeline's construction, arguing that any leak on the pipeline would threaten the tribes’ drinking water and that the pipeline’s path snakes through ancestral lands. The Republican-dominated North Dakota legislature is also pushing legislation that would make it legal to run over protesters with cars, among other anti-demonstration measures. The Indigenous Environmental Network's Dallas Goldtooth posted photos on Facebook Tuesday of "an AN/TWQ-1 Avenger vehicle," a surface-to-air missile system, overlooking the protest camp. "This is intimidation tactics 101," Goldtooth wrote. "Demonstrate the extent of your power in hopes to deter action."